I also posted yesterday on Facebook that Mr. CC is in the hospital :-( He went in on Friday and has a lung infection. I haven't heard a confirmed release date, but I heard one doctor mention possibly Wednesday. If you don't mind, please keep him in your thoughts and prayers! It seems to always be something going on! I try to plan, but no matter what, there will always be bumps in the road. I am glad he went in though, as they can give him the best care and help him feel better! I'm so excited to review for you, the Zoya Stunning Collection! I received this and the Irresistible collection, which will be reviewed soon too. Before we get to pictures, here is some Share the Love information! You can purchase the Stunning Collection for $48, or any individual shade for $8. https://www.artofbeauty.com/rd/018C7926 <------ This is a Share the Love link for the Stunning Collection colors, which is a way for me to earn points through them! So cool for me, but you guys can get something too! See what Zoya wrote: "Remember EVERYONE WINS with "Share the Love": When someone clicks on your personal link and sets up an online account, a $5 coupon a coupon for a FREE Bottle of Zoya Nail Polish will automatically be placed in their account and can be used immediately on their current order. 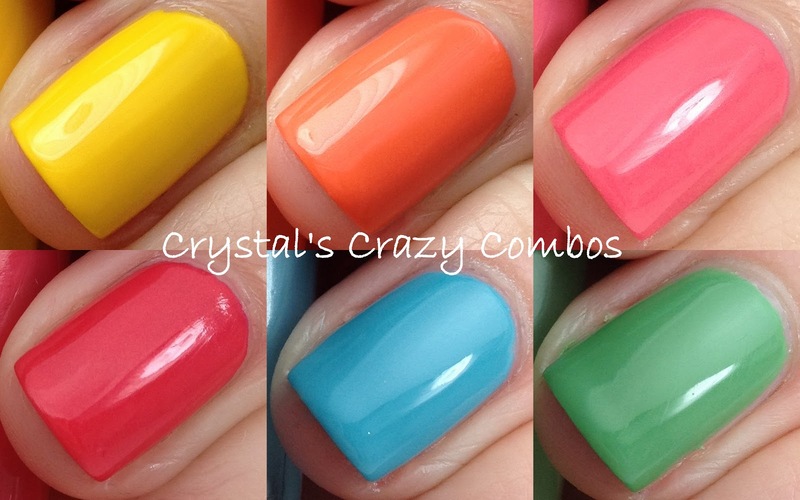 TIP: If you use this coupon and add 2 more polishes to your order, you get free shipping too! The coupon will appear in the "My Coupons/ Promos" section of their "My Account" Page." Let's get started!! First up, Darcy. For Darcy, I used 2 coats along with KBShimmer Clearly on Top. This is such a beautiful yellow. It actually reminds me of my old yellow Cavalier!! It's bright, and has that canary yellow to it. For Thandie, I used 2 coats along with KBShimmer Clearly on Top. I don't usually reach for orange, but this is bright and beautiful! I really loved this one with my skintone! I cannot wait to wear this on my toes this summer! Next up, we have Micky. For Micky, I used 2 coats along with Clearly on Top by KBShimmer. Up next, we have Yana. For Yana, I used 2 coats along with Clearly on Top by KBShimmer. For Rocky, I used 2 coats along with Clearly on Top by KBShimmer. Rocky is a nice cool baby blue. I am such a sucker for a great blue! I know I will wear this a lot. And last, we have Josie. For Josie, I used 2 coats along with KBShimmer Clearly on Top. I hope you enjoyed this look at the Zoya Stunning Collection! In case you missed above, here is some Share the Love information! You can purchase the Stunning Collection for $48, or any individual shade for $8. https://www.artofbeauty.com/rd/018C7926 < ------ This is a Share the Love link for the Stunning Collection colors, which is a way for me to earn points through them! So cool for me, but you guys can get something too! See what Zoya wrote: "Remember EVERYONE WINS with "Share the Love": When someone clicks on your personal link and sets up an online account, a $5 coupon a coupon for a FREE Bottle of Zoya Nail Polish will automatically be placed in their account and can be used immediately on their current order. TIP: If you use this coupon and add 2 more polishes to your order, you get free shipping too! The coupon will appear in the "My Coupons/ Promos" section of their "My Account" Page." I'm keeping Mr. CC in my thoughts. I'm glad he's getting the appropriate treatment, but I'm sorry that he's stuck in the hospital. I can most definitely relate! I hope he feels much better soon so he can go home. These colors are beautiful on you, as always. I agree that they look like perfect summer pedi polishes! Aw these are all so beautiful! Sending him well wishes too! The whole collection is so pretty! But I love Thandie most!